Fire Warning: This product involves a flammable gas. We sell these products to use outdoor in well ventilated areas, if you are not sure about your install please consult a qualified plumber. Please use extreme caution when using. We call this the OG (Original Gravity) because it is our original all-grain gravity system first built in the 1990's. Designed by another OG, retired MoreBeer! partner Regan Dillon, this was the first commercially available all grain system that featured the boil kettle under the hot-liquor tank to save space. It features no pumps or electronics and is centered around the time tested physics of gravity! Fluid flows from the Hot-Liquor tank on top, through the Mash Tun in the middle on into the Boil Kettle on the bottom. 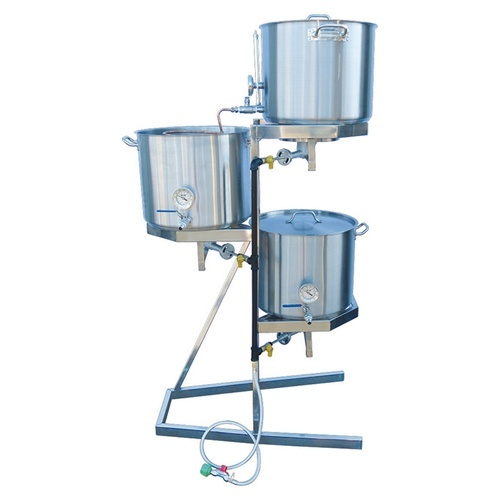 The OG comes with 15 gallon kettles which can be used to brew any sized batch between 5 and 10 gallons. This is truly the easiest to use all-grain system out there. With nothing electrical to go wrong, simple valves to control flow, easy to view mashtun, and no pumps its just plain easy. Even with a host of digital BrewScultpures and all kinds of other systems at our disposal we still really, really enjoy the simplicity of brewing on our Original Gravity system. And while simplicity rules on this system, you can of course add a pump to recirculate the mash or to push through a counterflow chiller at anytime. The frame is made from 304 stainless steel and welded in our metal shop in California. The low profile, Heavy-Duty stainless steel kettles are formed in a mold via the use a punch. This means they are made from a single piece of stainless with no welded seams. These beefy kettles then get an added aluminum layer that is capped with another layer of stainless. The added aluminum helps keep the kettle bottom from scorching and allows for easier cleaning. All the included ball-valves are made from stainless steel. Each kettle comes with a high quality Tel-True thermometer. Just a bullet proof package. Not intended for indoor use! Immersion Wort Chiller (5/10 Split) - 50 ft. x 1/2 in. More than anything to save space and less rigging during brew day. Iâ€™ve been waiting for this to go on sale. Is there an option to buy the stand only so that I can use my existing kettles? BEST ANSWER: This may not be an option. We do offer this product from Blichmann that may be of interest.